Too much… too little… just right! Here’s an interesting contradiction for you. Check out the following study results. Barbara Kahn and Brian Wansink offered their study participants a tray of jelly beans sorted by flavour and allowed them to take as many as they wanted. 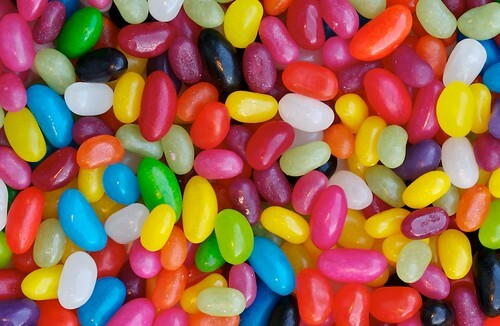 Those who were offered 24 flavours of jelly bean took more than twice as many beans as those offered only 6 flavours. Variety apparently increased the appeal of the item being offered. Sheena Iyengar and Mark Lepper offered grocery store customers a range of jams to taste-test (as discussed in a previous post). Those who were offered 6 flavours of jam were 10 times more likely to actually buy a jar of jam as those offered 24 flavours. Variety apparently reduced the appeal of the item being offered. You can see part of the issue at once: being offered the chance to eat free jelly beans isn’t the same as being offered the chance to buy jars of jam. But there’s more going on than that, and Elena Reutskaja and Robin Hogarth did several experiments to tease out some of the factors. They began by offering their study participants a choice of gift boxes that varied in colour, shape or both. Some people were offered 5 boxes to choose from; others were offered 10, 15 or 30 choices. Then they were asked how happy they were with the box they chose and the selection process. The results showed a distinct pattern: satisfaction levels were low if there weren’t many choices, but they were also low if there were too many. The most satisfied participants were those offered a medium number of choices – in this case, 10 or 15 boxes to pick from. Other experiments showed that the ideal number of choices varied depending on the circumstances, but the pattern was almost always there. When people are given the opportunity to acquire unlimited items (such as free jelly beans), a larger selection increases the number taken – but only if the items are organized to show the range of choices. A wider selection in a “mixed bag” format doesn’t appear to have any effect. People choosing a single item are more comfortable with a wide range of colour choices than a wide range of other characteristics, so if you want to offer variety without reducing appeal, vary your offerings by colour – and organize the colours. We are less satisfied with our own choices if we know that other people had a different selection to choose from, so if different groups are being offered different choices, don’t emphasize that fact. If your goal is to have your audience choose at least one of your offerings, it might be worthwhile to experiment a bit to discover the ideal number of choices. You’ll probably sell more of your organization’s pens/t-shirts/stickers if you offer 12 colours rather than 5, but you’ll probably attract more volunteers if you offer 5 ways to help rather than 12. Of course, these are my hypotheses based on the research. I could be completely wrong. So, get out there and test these possibilities during your next sale, membership drive or volunteer appeal. Prove me wrong. I dare you! Subscribe to comments with RSS or TrackBack to 'Too much… too little… just right!'. You don’t need to dare me I have proven it myself as a consumer. Now I need to figure out how to apply it to selling art. Sorry for the delay in replying, Gwyn; I just saw this comment. I’d love to know if you end up using anything from this post in your art sales. It sounds as though putting every separate piece on display at once might be overwhelming for buyers… leave some to be looked through rather than displayed? Worth experimenting with, anyway.